It's hard to imagine Fort Myers Beach as a remote stretch of green edged with white, soft sand and accessible only by boat. However, that's just what it was until the first "Little Bridge" was constructed to bring tourists and locals alike to the seven-mile Estero Island through Bunche Beach on the mainland. By the late 1920s, a new bridge (actually a second-hand one from the East coast of Florida) was installed near the current San Carlos Bridge. Little by little, Estero Island's attractive features, including miles and miles of white, sandy beaches, have captured the imaginations of visitors from near and far. This beach community draws thousands of visitors from Germany, France and the United Kingdom each year. Boating, sailing, fishing and spectacular Lovers Key State Park make this island a real recreational playground. Add to that a great number of family-friendly resorts, quaint cottages, Old Florida charm, restaurants serving fresh seafood from the Gulf of Mexico and an annual Shrimp Festival, and it's a beach vacation paradise. Nightlife gleams along the northern tip of the island around shopping-and-dining destination Times Square, and sunset watching is a favored pastime. The barrier islands of Sanibel and Captiva connect to the mainland by a three-mile-long causeway that stretches from the southwestern reaches of Fort Myers out across San Carlos Bay, where the Caloosahatchee River empties into the Gulf of Mexico. Created by nature to protect the mainland, the palm-tree and flower-lined islands are famous for their beaches and the incredible variety of shells that wash up on their shores. 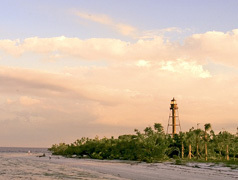 Beaches range from the Gulf-to-bay sands at Lighthouse Park at one end of Sanibel, punctuated by the historic light tower and home to a popular fishing pier, to Captiva’s romantic beaches, where sunset draws a nightly crowd. In between are family-friendly sandy playgrounds and long stretches of unpopulated sands fronting beautiful houses. Seashells carpet all the beaches, but Bowman’s Beach is especially known for fine selections, as well as great birding.